MB manufactured this rare puzzle in 1994. The title is Going for a Walk, or Le Promenade des Infants, by Timoléon Marie Lobrichon. The puzzle is COMPLETE (3036 pieces). The pieces and the box are in excellent condition. 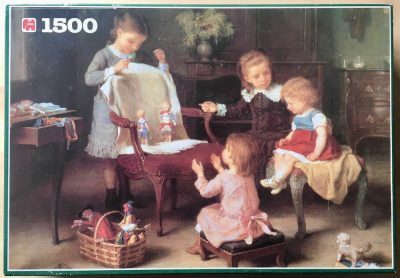 There is a 1500 pieces version of this painting by Jumbo, and another 1500 pieces version by Waddingtons. 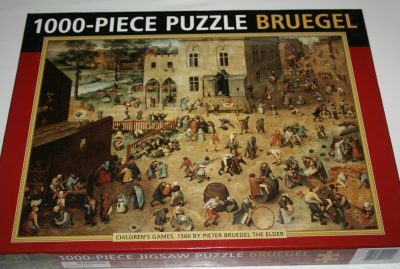 However, this one with 3000 pieces is the largest one and the most difficult to find. Puzzle size: 121.3 x 88.6 cm. Box size: 41.2 x 30.7 x 8.3 cm. Other titles: Le Promenade des Infants; Kinderpromenade; Wandelen met Kinderen; I bambini a Spasso; Paseo con el Colegio.